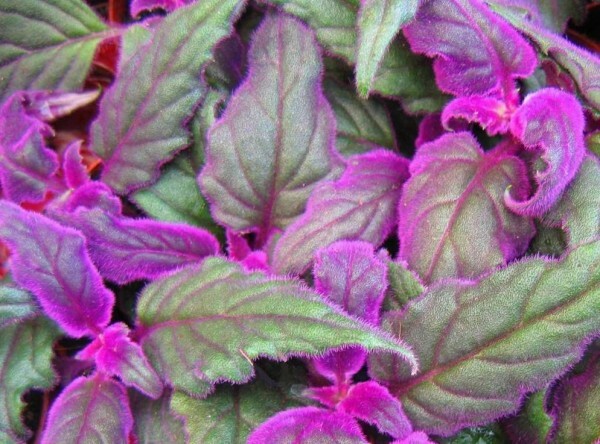 Light: medium to high light will keep the plant’s coloring bright. Watering: keep soil moderately moist. Allow soil surface to dry out between watering. Fertilizing all-purpose mix monthly during active growth, otherwise, feed every 2 months. Glistening purple hairs cover the leaves of this vine, giving it a velvety texture and it beautiful coloring. This rapid growing vine can grows three feet long of more, but is easily kept trimmed back. It can produce yellow dandelion-like blooms, but because of their unpleasant odor, it is best to clip them off before they open.